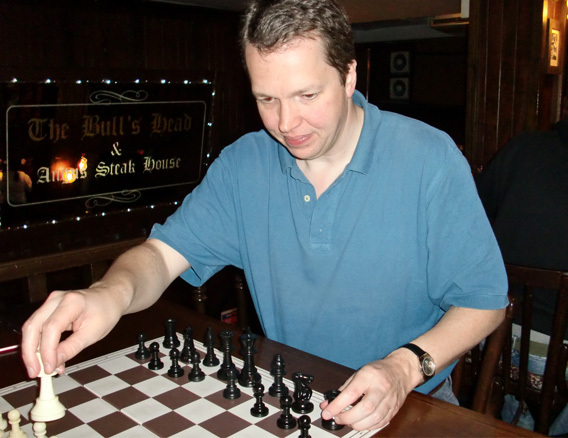 Alexander Klemm: Mr. Short, how did you prepare for the Thailand Open Chess Championship 2010? Nigel Short: I didn’t prepare; I just showed up. When a lot of your opponents are much lower rated, you never know who you get to play, so I didn’t prepare at all, basically. I just came here. I enjoy playing here. It’s a nice, friendly tournament, not with a lot of sponsorship, but the guys know me and they try, that’s why I come here. A.K. : Are you happy with your performance? N.S. : I think it’s O.K. [2nd place with 7.5/9] I don’t think this was the best chess I’ve ever played. But 7.5, that’s quite a lot of points. I was disappointed in a couple of games. I had an edge against Sune Berg Hansen [1st place with 8/9]. I could have pressed him but unfortunately I played some inaccuracies – and that turns out to be the decisive game of the tournament. I think he played very well here. A.K. : Is there pressure on you when you have to compete against players rated considerably lower than you? You risk a lot of your ELO points. N.S. : It’s a difficulty to get a balance in those things. I played two very strong tournaments before coming here [the London Chess Classic in London/England followed by the Chorus Chess Tournament in Wijk aan Zee/The Netherlands] and didn’t win a game in either of them, so it’s actually nice to have six victories here and I take to remind myself that I can occasionally win some games. It’s one thing making a draw with black against Carlsen and Anand, having Kramnik under pressure, pressurizing Ivanchuk and holding Shirov with black, but at the end of the day when you go to those tournaments and you end up minus 3, it’s a bit of a depressing business. A.K. : Since you are referring to the Chorus tournament, I watched your game against GM Jan Smeets live online. That was fun and exciting! A.K. : Have you seen any young players at the Thailand Open who impressed you? A.K. : What about the Asian players? N.S. : Nobody stuck out where I thought “wow”. I played this Indian kid. I don’t know how old he was, maybe 12 or 13. 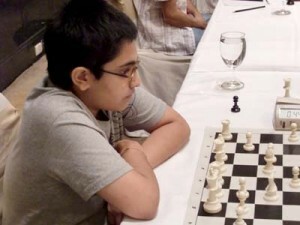 [Suri Vaibhav, India, born 1997, ELO 2347] Maybe he’ll be a promising player, maybe not, who knows. When you are 2300+ at such a young age you are doing fairly well. A.K. : What do you think about the Thailand Open format when comparing it to last year’s tournament? N.S. : …and even at some point, it depends on how the game goes, it can happen in the middlegame. And you are just in perpetual time trouble. Now, why don’t they have a slower time-control? Because they’re playing two games a day. And if you give an extra half hour after move 40, then the rounds are too long. Why not having an extra hour added to the game. You get a better quality game. One of the reasons why I played this year was because it was in appreciation of the fact that they had at least improved the schedule. But there’s another aspect. Most people who come here are amateur players. A lot of them come here for a bit of chess, they like to play, they like and enjoy the atmosphere. And they come here for a bit of tourism. There are lots of people who come here from considerable distances. When you have to play two rounds a day, you can’t do tourism. The key is to have one game per day. I’m really a chess tourist, but even for me my rating is my livelihood. If my rating is over 2700 it makes a big difference to me. If I lose points – and I haven’t counted but I probably lost points, but probably not very many, ok, this I can afford, but if you lose a lot it’s very expensive. A.K. : Do you prefer to play in a resort place such as Pattaya last year or in Bangkok? N.S. : Actually I’m fairly agnostic on this. I think the venues have been very good. In Pattaya and here we’re playing somewhere nice, air-conditioned, light, there’s enough space, and all those things. So purely from the point of view of playing I like it. I like Bangkok but I’m happy to play somewhere else next year. If it’s Pattaya again, fine, but if it’s somewhere new I’ll be happy too. N.S. : … That’d be fine with me, so I can see a bit more of the country. A.K. : What is it that you like about Thailand and have you had a chance to travel in the country? N.S. : Not a lot really. But the people are very friendly. It’s a fairly easy-going kind of place, the food is great, they give great massages here. When you come here for some relaxation, it’s a very easy and pleasant place to be, and most of the people seem to speak English, which is also great, so you will have few problems communicating in general. A.K. : Surely you must have heard about the political unrests in Bangkok before you came here. Some people cancelled their participation because of them. Did the unrests worry you before you came here or have they affected you in any way? N.S. : I was watching and I was keeping an eye on things, but you know, I played the Olympiad in Yerevan [Armenia, 1996], when they were attacking the parliament building and with tanks on the streets, THAT was scary. It was localized really. If you kept out of certain areas then you shouldn’t have any problems. It wasn’t directed against foreigners. If there were problems like that, then that would have been a concern. But this is a completely internal, political question and it doesn’t have anything to do with tourists. A.K. : Let’s talk about chess in Asia. Last year you played against Chinese players, but unfortunately they are not here this year because they’re playing in the Chinese league. Still, you had considerable opposition from Indian players. Chinese, Indian and Iranian players are getting stronger and stronger. Why do you think that is and how are Asian players in general changing the face of chess? N.S. : Don’t forget the Vietnamese! I mean it’s a steady process. If you go back to the early years of the last century, then there were only two areas for chess: Europe, which remains the center for chess, and the Americas, they have a lot of chess. Down in the South-Americas as well. Argentina. But Asia didn’t register very highly. I think the emergence of India and China in the world of chess has been one of the great developments. There are sort of localized powers. The Philippines has had some chess success, certainly since Eugene Torre and people the like since the 1970s. In Indonesia there’s some chess activity. Vietnam has come from almost nothing to being a fairly serious chess country. A.K. : How did they do it? N.S. : I don’t know the precise details, but they’re serious, there’s obviously some kind of government support, and it’s a little bit along the Chinese way, but on a smaller scale. GM Le Quang Liem won the Aeroflot Open [Moscow, Russia 2010] and the tournament in Kolkata [India 2009] which I played last year. It’s funny, I beat him at the Olympiad at Dresden [Germany 2008] and he scored fantastically well despite that. But he’s not the only one. There’s this development. I think it’s natural. The game is spreading further afield. 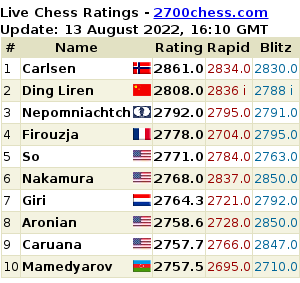 It’s not so much the number of federations that are in FIDE because there’s a significant number of those member federations in which chess barely exists. Nevertheless, there’s a sort of gradual spreading. India, of course they have played chess forever but weren’t particular good at it. And China, where they just didn’t play chess. Their emergence has been one of the most significant developments in the game. Apart from computers of course. A.K. : You coached the Iranian National Team in 2006 and 2007, and they did very well. Please tell me about that experience. Why did you coach them? A.K. : So would you consider coaching the Thai National Team? N.S. : [laughing] Yes, I would, if they had some sponsorship, I’d do it. I don’t care about the level. I’m interested in the enthusiasm. If people reach higher levels that’s good, and if you can assist in raising the standards, then that’s great. Thailand is not about to become a chess powerhouse, but I’m sure if I were to come some people would benefit, there’s no question about it. A.K. : Thailand has a handful of FMs. What do they have to do to improve their game? N.S. : They need practice. There’s no substitute for playing on a regular basis. It’s not enough if you play two tournaments a year. You just can’t do it. And when you have a limited pool of players, you know that this or that guy plays a certain way and you can change your strategy for him. But then the moment you move on to a bigger stage this sort of local knowledge isn’t necessarily going to help you, so you need a sort of wider experience. That’s one of the things. And a bit of coaching. People have jobs, they have demands on their time, but those who are enthusiastic can put aside a little bit of time. It’s surprising what can be done. One of my Iranian girls said to me: “Nigel, I’m at the university doing a degree. Now I’ve got some free time and would like to study chess. What should I do?” I gave her some little tasks. She asked how much she should study, and I said two hours a day. Of course I could have told her to study six hours, which she would have done on the first and possibly on the second day, and by the end of the week she would have given up. She did it and she wrote down all the answers. There were some things wrong of course, and yeah. We then went to the Dubai Open. This isn’t a particularly young player. She was in her mid-20s at that time with 2017 ELO. In Dubai she lost in the last round but nevertheless made a 2430 ELO performance, the best result of her career easily. For what, sixty hours of work I think. Directed. – Directed! – She’s never going to be Judith Polgar. That’s alright. There’s only ONE Judith Polgar. People can do a lot more, they can do an awful lot more, if they’re helped, they’re interested, prepared to work, and if they’re sent in the right direction, things can be done very clearly. That was one of my successes. I wasn’t even coaching, I wasn’t around at the time, I just suggested what she should do, and she did it and it paid off extremely well. A.K. : You have played chess tournaments in many countries, but is there still a place, maybe here in Asia, where you would like to play, maybe for the first time? N.S. : I’m one of these guys who is prepared to visit any country on earth. So the answer is yes, I would. As far as tournaments are concerned, not every place has tournaments. But in Asia I’ve been to a lot of places. I’ve been to the Philippines, Japan, South Korea, Brunei. I’ve been to Cambodia, Laos, China. I love China, I really enjoy going there. It’s a very exciting country, pulsating, you can feel the energy of the place. – Burma! Maybe I should go to Burma! My grandfather was in Burma in the war fighting the Japanese. I might have some cousins there [laughing]. All those months in the jungle, you know. N.S. : … You know the joke, Orwell wrote three books on Burma: Burmese Days, Animal Farm and 1984 [laughing]. Actually, I brought Burmese Days with me, which I intended to read because I’d like to … ok … I’m in a different country now but somehow in the geographical area. I have it but wasn’t quite in the mood for reading here. A.K. : Will you come back next year? N.S. : I’d say there’s a fair chance. I won’t say definitely, but I basically like the people and it’s a nice environment. As you know this year was weaker than it was in Pattaya but I also think they’ve done incredible things on a tiny budget. This event started very small and extended and extended. There’s only so much you can do without increasing the budget. If you want to go to the next level, raise it. It needs some more dosh [money]. Where it will come from, if it will come, is another matter. But I like the enthusiasm, the warmth and the energy, and I like the fact that these are amateur players trying to put on a good event. I was here a couple of times before and have given simuls at the Stock Exchange and the British club. They were enjoyable experiences. There is this connection, and I feel that the people are my friends. A.K. : I hope you will come back next year. Thank you for your time. N.S. : I probably will. Thanks.